Also known as the skin bird or Canje Pheasant the Hoatzin is a very unique species of tropical bird found in swamps , riparian forests and mangroves of the Amazon and the Orinoco Delta in south America. 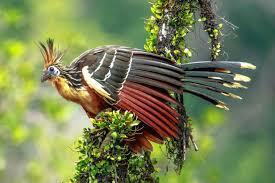 The Hoatzin is pheasant size a noisy species with a variety of Hoarse calls including groans croaks hisses and grunts . They are the only bird species with a digestive system that ferments vegetation as a cow does , which enables it to eat leaves and buds exclusively. They have a fore gut that they use to break down the plants they eat sing bacterial fermentation resulting in a foul smell coming from the bird earning its name the Skin bird. However evolution operated on part of their digestive anatomy called the crop a feture common to birds to make it function much like a cow's rumen and as a result the crop is so large that it displaces muscles that otherwise would have been used for flight .. Although Hoatzin can still flight they just can fly as well duw to this evolution. The Hotzin birds are also notable for having chicks that possess claws on two of their wing digits which allow the chicks to move about tree branches without falling into the water below as soon as they hatch. When a predator hawk attacks the mature Hoatzins fly about to distract the predator while the clicks hide under thicker cover. If spotted by the predator the chicks plunge into the water swim away and use their clws to haul themselves back onto the nest. Researchers speculate whether the claws are a result of selective pressure caused by predation or that the Hoatzin were a direct descendant of Archaeoptery. Because of its claws some researchers have wondered if the Hoatzin was a direct descendant of Other think the claws are a more recent adaptation , having emerged as a result of the selective pressure caused by predation.